A case of a ferromagnetic foreign body in a medically compromised patient was reported. The patient was a 45-year-old male who consulted our department complaining of a foreign body accidentally impacted in the right cheek. X-ray examination revealed a foreign body at the lateral aspect of the right mandibular ramus. The removal of the foreign body was scheduled, but the patient did not return for the procedure. After 8 years he revisited our department for the removal of the foreign body, because it had been found to be ferromagnetic and a barrier to MRI examination. X-ray examination confirmed the foreign body was located at the same site as 8 years prior. Although the patient was suffering from liver cirrhosis with thrombocytopenia and leukopenia, the foreign body was successfully removed under general anesthesia. The foreign body was 12 × 5 × 1 mm, weighed 0.48 g, and was ferromagnetic. The patient’s postoperative course was uneventful. X-ray examination confirmed the removal of the foreign body. Since the surgery, the patient has been in generally stable condition with no complications. This case was a rare example of a foreign body that needed to be removed for medical examination. Keywords: Cheek, Ferromagnetic, Foreign body, Magnetic resonance imaging, Mandible, Masseter. Foreign bodies in the maxillofacial region are not uncommon  and can include metal, wood, plastics, or glass. Some of these objects can become a cause of infection and thus need to be removed . Metallic foreign bodies are often inert (dormant) and may cause no problems for several years . However, some metallic materials may cause a delayed reaction and damage adjacent structures [3-5] . In addition, if a metallic foreign body is ferromagnetic, it is an obstacle to MRI examination [6-8]. 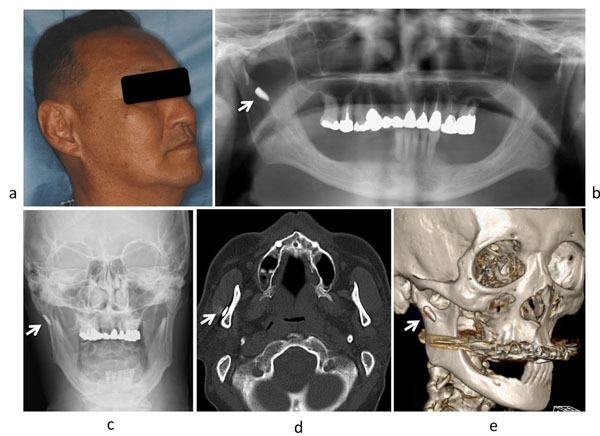 In this report, we presented a case of a ferromagnetic foreign body asymptomatically impacted at the lateral aspect of the mandibular ramus in a medically compromised patient. The foreign body was removed 8 years later after the first identification of impaction so that the patients could receive an MRI examination. The patient was a 45-year-old male having visited our department with a complaint of right facial swelling in 2007. He felt a ‘shock’ at the right cheek as if hit by something hard while operating a construction vehicle. Bleeding from the skin of the right cheek was observed but stopped after a few minutes of applying pressure to the site. In a few days, swelling developed on the right side of his face accompanied by a slight trismus. He visited a dental office and was prescribed antibiotics and referred to our department. The patient was well-built, and the right side of his face was diffusely swollen. The wound at the site of penetration was not remarkable. Panorama and posteroanterior X-ray examination revealed a small radiopaque foreign body at the lateral aspect of the right mandibular ramus. CT examination indicated that the foreign body was located under the masseter muscle. The foreign body was not palpable from the surface of the face or the oral mucosa. With the diagnosis of a foreign body on the right side of his face, the removal was planned after receiving medications for symptom improvement. However, the patient did not return to the hospital or for a follow-up appointment. In 2015, the patient revisited our department for the removal of the foreign body. In 2008, he felt strong traction in the right side of his face when he approached an MRI scanner for a brain image examination. He remembered that a foreign body was impacted in his face. Because it was shown to be ferromagnetic, the MRI examination was cancelled and contraindicated. He was positive for the hepatitis C virus and suffering from liver cirrhosis. Recently, hepatocellular carcinoma had developed and was treated by radiofrequency ablation. His liver function was impaired and had a Child Pugh B score in addition to thrombocytopenia and leukopenia. Although esophageal varices were not observed, he needed to be strictly followed. Because MRI examination was necessary to evaluate this condition, the removal of the foreign body was reconsidered. The patient’s face was symmetric without visible scaring from the wound (Fig. 1a). The foreign body was not palpable through the skin or the oral mucosa. There had been no episodes of swelling or pain on the right side of his face since the last visit. Panorama and posteroanterior X-ray (Fig. 1b and c) and CT (Fig. 1d and e) examination showed that the foreign body was present at the same site as 8 years prior. Facial appearance and X-ray findings 8 years after the first visit. (a): Facial appearance of the patient (b): Panorama X-ray (c): Posteroanterior X-ray (d): Axial CT (e): 3D-CT A foreign body (arrow) was observed at the same location as the first visit. Consultations with internal medicine and the anesthesiology department were made. The patient’s general condition was strictly controlled before surgery. Removal of the foreign body was performed under general anesthesia. An incision was made along the right anterior mandibular ramus. Soft tissue under the masseter muscle was dissected over the periosteum of the mandibular ramus (Fig. 2a). The foreign body was not visible from the incision but was palpable by the finger of the surgeon. Care was taken not to cause the migration of the foreign body into the deep space. After blunt dissection of the surrounding tissue by the finger of the surgeon, the object was removed with forceps. The wound was gently irrigated with saline and hemostasis was confirmed. The wound was closed by suturing after the insertion of a silicone drain. The foreign body was 12 × 5 × 1 mm and weighed 0.48 g (Fig. 2b). It was ferromagnetic and attracted to a magnet (Fig. 2c). Intraoperative finding and the foreign body removed. (a): Intraoperative finding. (b): The foreign body removed. (c): The foreign body attracted to the magnet. The patient’s postoperative course was uneventful. Swelling around the wound was minimal and no postoperative bleeding or infection was observed. The drain and the threads were removed 2 days and 7 days after surgery, respectively. Postoperative X-ray examination revealed that the foreign body was removed and no residual radiopaque materials were observed. The patient was discharged and received follow-up as an outpatient. Since surgery, he has been in generally stable condition with no complications related to surgery. Metallic foreign bodies may be inert (dormant) and remain in the soft tissue without causing damage to adjacent tissue. However, some can produce chronic inflammatory reaction and need to be removed [3-5]. In the present case, the foreign body had been present at the same site without causing any symptoms or complications for 8 years. However, it was found to be ferromagnetic when the patient approached to an MRI scanner. He felt strong traction at the right side of his face due to the impacted foreign body. Therefore, MR examination was canceled, and was contraindicated . The present case raises concern regarding foreign bodies in the body. MRI examination is often performed to evaluate a condition and detect lesions in a variety of organs and tissues. If ferromagnetic or conductive metallic foreign bodies are impacted in the body, the strong magnetic field of the MRI systems represents a serious risk of injury for patients such as dislodgement and/or excessive heating due to the applied radiofrequency [6-8]. However, it is often not possible to ascertain patients’ MRI compatibility when foreign bodies may have become impacted accidentally. Radiographs and CT images can reveal the presence and location of a foreign body , but the physical properties remain undetermined . Therefore, a system or apparatus by which unknown foreign bodies can be determined to be magnetic, in terms of MRI compatibility is necessary [8, 10, 11]. Another obstacle is the risk of removal of the foreign body. It may be located adjacent to important and complicated anatomical structures such as nerves or arteries, that need to be protected [1, 12]. In addition, the object may be fragile and break into small pieces, which may complicate removal. In the present case, it was thought that the foreign body was present at a relatively safe location and was removed without damaging the local structure or function. However, the patient was medically compromised. There could be a problem with hemostasis and complications such as infection or poor healing after surgery due to severe liver dysfunction. Therefore, the risk and the benefit of the removal were carefully discussed. MRI is a useful method for monitoring a patient’s condition and for detecting other morbidities especially in compromised patients. If the foreign body had not been impacted in the body of this patient, MRI examination would have been medically indicated. Therefore, the removal of the foreign body was considered desirable if it were to be performed without causing serious complications. In the present case, the general condition for the surgery under general anesthesia was of concern because of the patient’s poor liver function and pancytopenia. However, the condition of the disease was not expected to improve by treatment and progressed. We considered that the surgery would be tolerated well by the patient in his current condition and therefore, decided to perform the surgery before further aggravation of his condition or development of other lesions so that MRI examination could be performed when medically indicated. The foreign body was clearly identified on X-ray film, but direct visual identification at the surgical field was impossible. Fortunately, the foreign body was a metallic fragment with a relatively simple shape. It was identified by the finger of the surgeon during the procedure and was successfully removed using forceps. The skin over the posterior border of the mandible was pressed to prevent the migration of the foreign body into the deep space around the mandibular ramus . If the foreign body had been smaller or presented adjacent to complicated anatomical structures, the removal would have been quite difficult. In such cases, direct imaging during the surgery should be considered to identify the location and relationship to surrounding structures [1, 12, 14]. In summary, a ferromagnetic foreign body asymptomatically impacted at the lateral aspect of the mandibular ramus was removed 8 years after impaction in a medically compromised patient so that he could receive a medically indicated MRI examination. The present case was a rare example of a foreign body that needed to be removed for other medical examinations. Eggers G, Haag C, Hassfeld S. Image-guided removal of foreign bodies. Br J Oral Maxillofac Surg 2005; 43(5): 404-9. Aregbesola SB, Ugboko VI. Unusual foreign bodies in the orofacial soft tissue spaces: a report of three cases. Niger J Clin Pract 2013; 16(3): 381-5. Ryu CH, Jang YJ, Kim JS, Song HM. Removal of a metallic foreign body embedded in the external nose via open rhinoplasty approach. Int J Oral Maxillofac Surg 2008; 37(12): 1148-52. 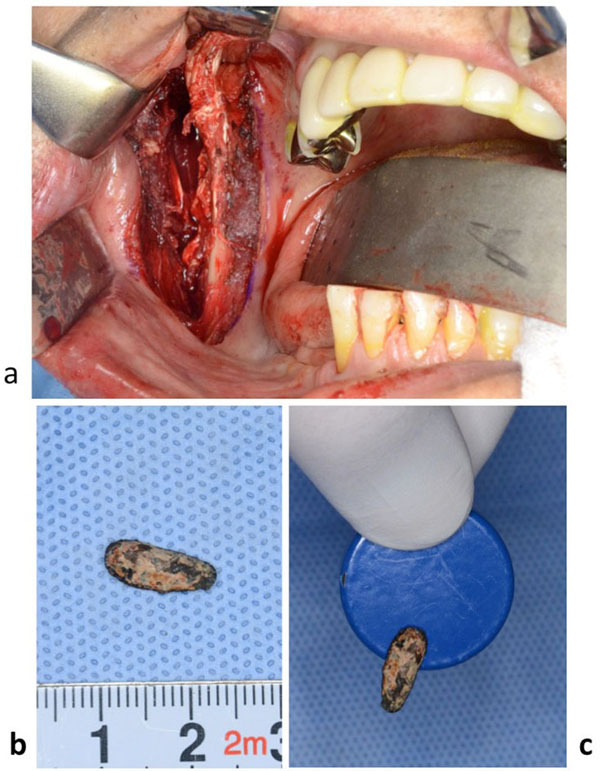 Persson S, Gjerdet NR, Tornes K. Metal fragment in the temporomandibular joint: a case report. Int J Oral Maxillofac Surg 2003; 32(6): 653-5. Akhaddar A, Akhiri M. Metallic foreign body in the cheek mimicking a chronic facial abscess. Pan Afr Med J 2013; 16: 136. Metterlein T, Haubner F, Knoppke B, Graf B, Zausig Y. An unexpected ferromagnetic foreign body detected during emergency magnetic resonance imaging: a case report. BMC Res Notes 2014; 7: 808. James CA, Karacozoff A, Shellock FG. Undisclosed and undetected foreign bodies during MRI screening resulting in a potentially serious outcome. Magn Reson Imaging 2013; 31(4): 630-3. Gianesin B, Zefiro D, Paparo F, et al. Characterization of ferromagnetic or conductive properties of metallic foreign objects embedded within the human body with magnetic iron detector (MID): Screening patients for MRI. Magn Reson Med 2015; 73(5): 2030-7. Javadrashid R, Fouladi DF, Golamian M, et al. Visibility of different foreign bodies in the maxillofacial region using plain radiography, CT, MRI and ultrasonography: an in vitro study. Dentomaxillofac Radiol 2015; 44(4): 20140229. Shellock FG, Karacozoff AM. Detection of implants and other objects using a ferromagnetic detection system: implications for patient screening before MRI. AJR Am J Roentgenol 2013; 201(4): 720-5. Lawrence DA, Lipman AT, Gupta SK, Nacey NC. Undetected intraocular metallic foreign body causing hyphema in a patient undergoing MRI: a rare occurrence demonstrating the limitations of pre-MRI safety screening. Magn Reson Imaging 2015; 33(3): 358-61. Gui H, Yang H, Shen SG, Xu B, Zhang S, Bautista JS. Image-guided surgical navigation for removal of foreign bodies in the deep maxillofacial region. J Oral Maxillofac Surg 2013; 71(9): 1563-71. Kühnel TV, Tudor C, Neukam FW, Nkenke E, Stockmann P. Air gun pellet remaining in the maxillary sinus for 50 years: a relevant risk factor for the patient? Int J Oral Maxillofac Surg 2010; 39(4): 407-11. Holmes PJ, Miller JR, Gutta R, Louis PJ. Intraoperative imaging techniques: a guide to retrieval of foreign bodies. Oral Surg Oral Med Oral Pathol Oral Radiol Endod 2005; 100(5): 614-8.